I have crossed the 1550 LinkedIn followers threshold (currently at 1563). I have experienced rapid growth. Earlier this month I was at 1450 followers. My rapid growth is due to my videos and celebrating my 1-year ITIL anniversary and 5-year PMP anniversary. 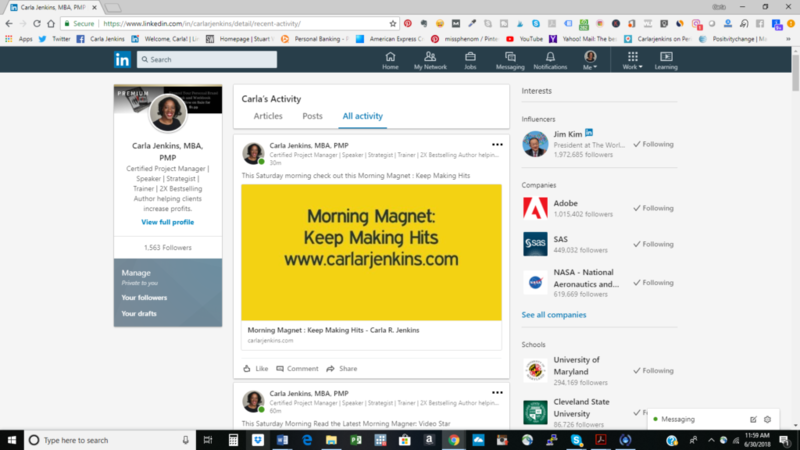 I have shared these articles within the relevant LinkedIn groups and my PMP article has gone viral nearing 100 views in less than two days. I have written both articles from the heart discussing how these PMP and ITIL licenses have helped me professionally. I have increased my video content. In the past week I have decided to do 2 videos per day: one on my personal Facebook page, another on my Facebook business page. I have also done YouTube Livestream bringing back Project Management Mondays Live (PMM Live) show. Video is generating a whole lot of traffic. I will keep creating video content because I love to communicate and video is the highest converter. I have received inMail from people saying that they love my video. Getting to 1600 LinkedIn followers, improving my video creation and focusing on helping people learn more about the certification process and why pursue certification. I am all about helping as many people better understand the certification process. I have done it four times. Follow me on LinkedIn at www.linkedin.com/in/carlarjenkins.